Our Maundy Thursday Service is a Reflective Service at 7.30pm on 13th April. It is titled “A Tale of Two Cups”, from the Last Supper to the “cup” Jesus speaks of in the Garden of Gethsemane. Come and find out more about the cup of life and the cup that brought death, what does it mean for us? This service will include The Lord’s Supper. We’d like to warmly welcome you to our Good Friday morning service on 14 April at 11.00am (please note the slightly later start time). 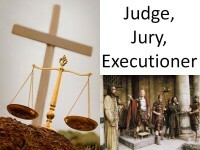 Our Pastor will be looking at the theme of “Judge, Jury and Executioner”, what were the events leading up to Jesus death? What was our role in it? There will be activities for all ages. We’d like to invite you to celebrate on Easter Sunday at 10.30am, with us. 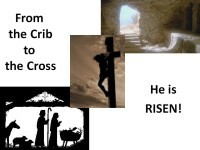 Celebrate “From the Crib to the Cross” as we see how the Christmas story leads us through the Cross on Good Friday to a risen Jesus. This will be an all age service. If you enjoyed our Carols by Candlelight service why not come and hear the rest of the story of Jesus and discover what it means for each of us.